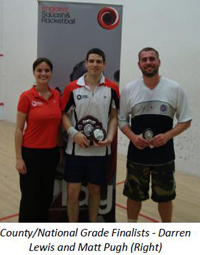 Just over two weekends ago the West Midlands Regional Team held their first ever West Midlands Racketball Closed event. The venue for this event was the leafy suburbs of Stourbridge Lawn Tennis & Squash Club. The venue of which being a very pro racketball club, boasting 14 day time racketball leagues which just goes to show that racketball is one of the fastest growing sports in England. 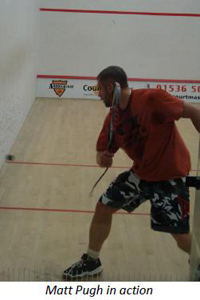 The weekend itself managed to be one of the hottest weekends of the year so far, which proved a challenging factor for an in-door racketball tournament. However, the soaring heat and temperatures that were more at home in the Sahara failed to stop the event from proving a success. The draws for the event managed to produce two graded knockout draws. These were the Club level player (B Grade) and the County/National standard of player (A Grade). Both of these grades played in a knockout draw with a plate competition for the first round losers. Firstly, the club competition (B grade) saw a mix of players who played the sport in ladders or box leagues at their clubs competing for the title. 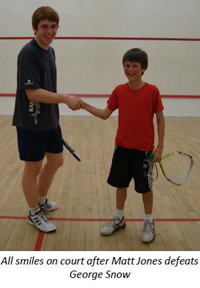 The final was contested by 17 year old Jonathan Pitts who managed to gain his place to the final with some great movement around the court, especially considering the temperatures ac-companied with some great boast shots that fooled many of his opponents. The other finalist was Keith Young, father to one of our academy players and currently our U11 Regional Champion Anna Young. Keith battled his way to the final with some quality shots of which wound down most of his oppo-nents. Keith managed to get off to the perfect start in the final, taking the first game and was 8-2 up in the second, however Jonathon was not going to let Keith have it all his own way and managed to battle back from 2-8 down to win the game 11-8. This levelled the scores at 1-1. The 3rd game saw a close encounter which was just edged by Keith, producing some good lengths, restricting Jonathon’s shot selection and eventually leading to Keith taking the game and the 2-1 lead. The players rested for a quick drink and then it was time for the 4th, a thrilling encounter which seemed to take it out of both players however with all the long rallies looking pretty even, Keith was still producing the finishing shots to build up a lead and with all the questions being asked by Keith, the youngster from Energie fitness was unable to respond leaving Keith to follow in his daughters footsteps and take the Regional title (B Grade Winner). The weekend also played host to the County/National grade (A grade). This event was also played with a knock-out competition and had some of the big names in the region competing for the title. 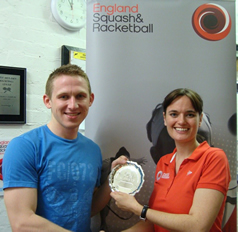 Andy Warmington (Solihull Arden – Head Coach) was in the draw alongside Andrew Davies (Current Shropshire Racketball Champion). Also in the draw were ex squash professionals Darren Lewis and Vicky Hynes and current full time squash player, Dean Russell. 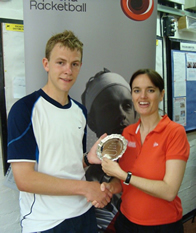 The draw also had Edgbaston Priory’s Matt Pugh, who was a quarter finalist in the O35’s National Racketball Tournament, three weekends before. 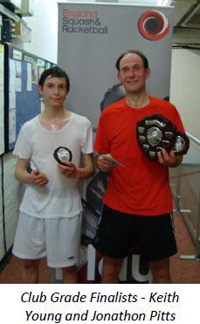 leading to Darren winning the match 3-0 and taking the title of West Midlands Racketball Closed (County/National) A Grade Champion. final. Last but by no means least, many thanks to all players that attended the event who all showed great commitment to compete on the hottest weekend of the year! !